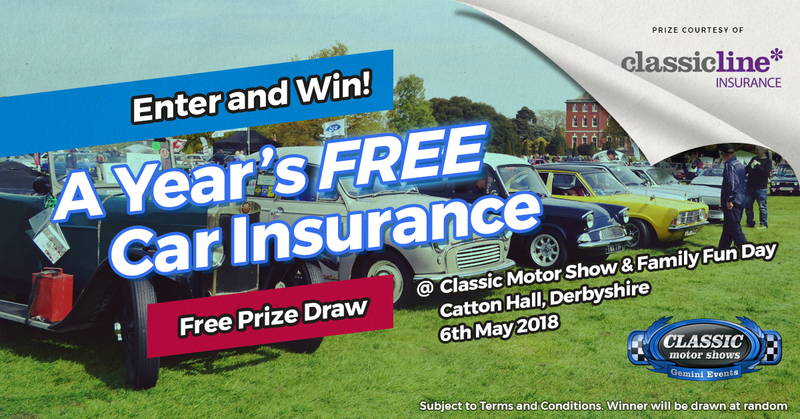 Visitors to the ClassicLine Insurance sponsored Classic Motor Show and Family Fun Day at Catton Hall in Derbyshire on Sunday 6th May have the chance to win a year’s free car insurance. The ClassicLine Insurance prize draw will be one of many highlights which will see up to 700 classic cars, including pre and post war vehicles, American and military motors, plus classic motorcycles and modified cars, on display. The one-day motoring extravaganza is also a fantastic way for all the family to enjoy the beautiful surroundings of Catton Hall near Walton Upon Trent alongside the River Trent surrounded by hundreds of classic cars. Other activities include an interactive arena with vehicle parades including Tamworth Tired Tractors, free face painting for children, free ‘goody bags’ for children who bring their favourite Teddy to the show, plus trade and autojumble stalls.